Finally, I can start to talk about giant veggies as I will start the pumpkins this month inside. Here is some background information on some giant vegetables so you will understand them. Later in another post, I will get more specific on which giant veggies I am growing. All or most of the giant pumpkins, giant squash, giant marrow (look like BIG zucchini) and giant tomatoes where people want to BREAK RECORDS AND GET THEM OFFICIALLY WEIGHED are listed by the weight/grower’s name and year. So for example: the new world record pumpkin holder is held by a woman named Christy Harp who broke the record last year-so her pumpkin is listed as 1725 C. Harp 09. 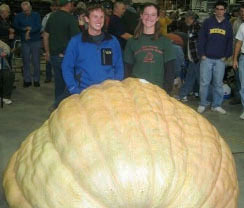 This means her pumpkin weighed 1725 lbs, her name is C.Harp and 09 is the year it was grown. Here is a pic of her with her world record pumpkin. This pumpkin came from a genetic line of very big pumpkins, so those of us after records look at the parentage of each seed to give us what we think are the best odds of growing certain traits-ie size, shape, or color and weight. Now you don’t have to go to any special weigh-offs or buy any specific seed from a grower unless you want it recorded. 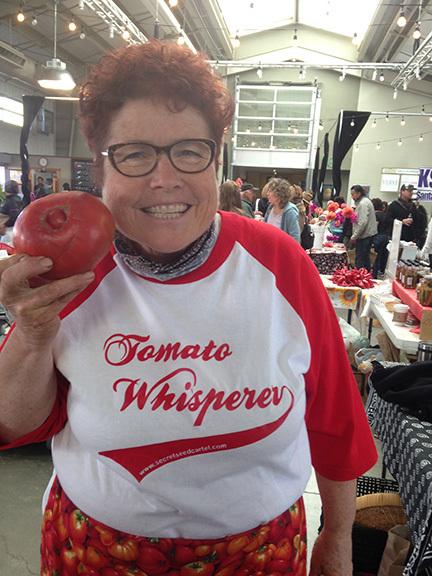 There are some varieties of these vegetables that are known to grow very BIG. If you plant these, you will grow some very big vegetables maybe not a world record but big. None of these are GMOs but almost all are hybrids. Here are some varieties of giant vegetables to get you started that will give you the potential to grow em BIG! GIANT PUMPKINS-If you don’t want too big, try Big Max pumpkins where you have the potential to grow a 100 lb pumpkin but hands down the Atlantic Giant Pumpkin variety is the one most grown-you can get it generically like I did my first year from amazon.com (I grew a 225lb pumpkin that year) or you can join some giant pumpkin clubs and/or organizations and buy or ask to get some specific seed that has been grown by one of the big growers. It’s a whole different thing or as Christy Harp said about giant pumpkin growing, “It’s a hobby gone mad”! The interesting thing is many giant pumpkin growers are growing them organically. Now isn’t that cool! One of the most important things I learned from some growers is to create really healthy soil. 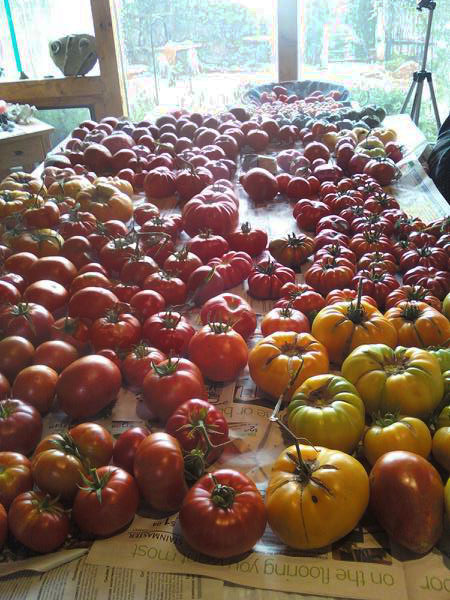 Big Zacs, Giant Belgiums, Delicious and many more to grow 3 lb plus maters. MARROWS-They aren’t generally grown here in the states but are big in Europe and I’m not sure why. Their seeds are harder to get here. I got one seed from a grower in the Netherland that I will try this year. It was 76 lbs. We’ll see how big it’s off spring gets or if it will even do well here. This entry was posted in general, GIANT PUMPKINS, GIANT TOMATOES, GIANT VEGGIES-OTHER, TOMATOES, VEGETABLES and tagged giant pumpkin, giant tomato, giant veggies, marrow giant vegetables. ← more cool season crops in!